The more thought I give to having kids, the more I realise we are screwed. Stay home and miss out on income and retirement contributions (only for a few years sure, but that adds up to a lot). Keep working and struggle to juggle everything (I find it hard enough to run our lives as DINKs, let me tell you). If T could increase his income, maybe I could stay home and freelance – I’d earn less, but something is better than nothing . If I remain the bigger earner, well, I don’t know what he could do on a self-employed basis if he stayed home. If there was an easy answer, his stints of unemployment in our time together wouldn’t have been so bad. Also, I shudder to think what kind of scene I would come home to at nights. Great dinners, no doubt, but probably a filthy house (and grubby, if happy, kids by default). And what if, as Her Every Cent Counts made me consider, a difficult pregnancy/birth physically affects my ability to work? I feel totally torn between two trains of thinking: One: I work in an office – the world wouldn’t miss a beat without me – how can that ever compare with raising mini human beings? Two: I really like what I do – even if I’m not saving the world – do I have to feel guilty about that? Also, I need adult interaction. My tolerance for children is even more limited than for people in general, and needs to be balanced out. On a slightly different note … My parents were around wayyy too much when I was a kid. They both worked full time when we lived in Kuala Lumpur, but after moving to NZ, they both mostly worked part time or at home. It annoyed the hell out of me back then. On the other hand, we all know people whose parents were never around. That usually doesn’t end so well either. Mine were too strict; other parents weren’t strict enough. I am determined to find a balance, but I am well aware I am destined to fail. We’re having this exact same problem at the moment and we can’t come up with an answer. It’s going to be such a hard decision when the time comes – how do you know you’re making the right choice? My balance is to work at 3 months which is .. now! NOW!!!!! For me, that’s where the spiritual side of having kids comes in. Using just numbers, the math of kids will never look right! I feel you on most of these — the money, the health, and the freelance bits especially. My female friend feels guilty because her education is taking longer than expected so they have to put off kids for a few more years even though she and he desperately want kids now. I dont know how to make it work honestly. I hope at one point it just does. Your priorities change once you have kids and simple things become more important – going to the park, learning to swim, bedtime stories. You tend to adapt, so even thought you think now you are having a hard time managing, you will manage with children. You’ll just stop doing some things you do now, or do them less. Income earning is another topic. Would you be entitled to maternity leave and how long do they give in NZ? Most people take a year off, but of that only a few months is paid and it’s at essentially minimum wage (I suppose there may be some bigger orgs that top up to full pay). I think that once the kiddos arrive you’ll figure out what will work for you. Don’t think too much about it now…too overwhelming. At the end of the day you’ll make it work. Thank you for this post. I often wonder, why do people have kids? I know lots of people that have them “by accident”. But I’m now at an age where some people have them on purpose. My husband have been together for 12 years and do not have children. We just haven’t had the time or money to have them. Now, I know there are people who have families on less time and less money, I just don’t know how they do it. Would I want to live a life of sacrifice and broken dreams? I often hear parents say that while they love their children, they resent having them and missing out on the freedom of not having a family. We considered having kids if we won a few million in Lotto but even then, it wasn’t a no-brainer. I’d love to give my parents grand children to play with, but that should not be the only reason to have kids. I’m waiting for my biological clock to start ticking and push me to want to have kids. I’m 30 years old and it hasn’t started ticking for me. To be honest, we would rather have pets. Apparently 1 in 5 women will not have children. Doing a quick survey around at my friends at age 30ish, it’s more like 1 in 5 have children. Maybe 10 years from now, this will change as women start families in their 30s and 40s more and more these days. The question is, do you really want kids? If you do, are you ready to have them now or would you rather put the decision aside for a few years and look at it again when you are ready? There’s absolutely nothing wrong with deciding you’re not ready to have kids (or don’t want them at all). If do want children and you think you’re ready, start living off of only T’s income for a year and save yours. If you can’t do it then, as you say, you’re going to have to think of alternative ways to afford children. Increasing T’s income, taking on freelance work. Moving out of Auckland will have it’s trade-offs. On the one hand, you’ll be saving money on rent. On the other, you won’t have family nearby that you can depend on to look after the kids occasionally or just provide support. It’s a tough decision and something I’m sure many young couples struggle with – especially in Auckland where living costs are so high. Talk to your friends who have already gone through this and see how they managed. Good luck! I can definitely relate to your worries. As women, our jobs only continue to get more difficult and we’re forced to attempt to find a balance when it may not be possible. I struggle enough with my current job and can’t imagine starting a family. Honestly, I don’t know how my parents did it! In Canada, we’re fortunate enough to be entitled to a full year off of work for maternity leave, paid at a percentage of what you made before you leave. Money was tighter for us, but not super uncomfortable. Of course, since my paper shut its doors, it made my decision on whether or not to go back to work easier. With a lack of options out there for me, I stayed home and am re-educating myself in a different field. But do I miss going to work every Monday-Friday? Definitely. While I love staying at home and raising my daughter, I definitely miss talking to adults and even dealing with the public, as crazy as that may sound. Making the choice to have kids or not is definitely not an easy one to make for a lot of people, and I can totally see why some women are choosing to have them later and later in life. Honestly, dodging the tough questions and my health have been major factors in my refusing to even think about kids for most of our relationship. I always wanted to remain the breadwinner because I simply can’t fathom staying home but that’s not really an answer when you’re also probably the one who has to HAVE the kids (there’s always adoption). I don’t think there’s any reason to feel guilty, in this day and age, for enjoying the work you do. Many of us either don’t have the luxury of (for those who can choose this because of wealth) or the willingness to sacrifice an income to stay at home; why feel bad about actually enjoying the work you have to do outside the home? I fully intended to stay home once our daughter was born. When we knew we wanted to try to get pregnant, we lived off my husband’s salary and saved mine, we cut back on unnecessary expenses, etc. Toward the end of my pregnancy, a nagging feeling in the back of my mind told me not to quit before I left for maternity leave. Sure enough, about 12 weeks into my maternity leave, I realized I wanted to go back to work part time when my leave was over. I love being with my daughter, but I am a better mom if I have a few hours of adult interaction several days a week. I work about 20 hours a week in an office now (although I have some flexibility to work from home). I think 10-15 hours would be ideal someday, but for now, we’ve struck an OK balance. I realize I’m very fortunate to be in such a flexible situation – it’s one of the reasons I kept working in higher ed instead of leaving to make (potentially a lot) more money in the private sector. Definitely a tough decision to have to make for a couple who really wants to have kids. Reading the comments, I agree with Michelle (it will work out in the end, there’s never really a perfect time) and Genie (in that, I too, have weighed up the pros and cons and have 99% made the decision to NOT have kids). There is however, also the pressure you get from choosing NOT to have kids, mostly from family! I really understand your predicament. The DH and I decided that we wouldn’t have a child together. I have a step-son from his prior relationship who lives with his mom in another country so we only see him once a year. We are both in our late thirties and we met later in life which did factor into our decision. We have established careers that we enjoy but takes up time and moderate travel is involved. I enjoy children very much but I realized that I didn’t feel the desire to be a full-time parent. As the previous poster said, we do feel some pressure from some family members because of our choice to not have a child. If you and T decide kids are what you want then you will make the needed compromises. I think about this often. I definitely want children, but there are so many things I want to do prior to having them, and so many considerations before making that decision. I am happy that , as Cara says, we have a year off here for maternity leave, but a year is not very long! I think about this too since we’ve talked about having kids in a few years. My parents worked a lot when I was growing up so I didn’t see them much and I don’t want the same for my kids. 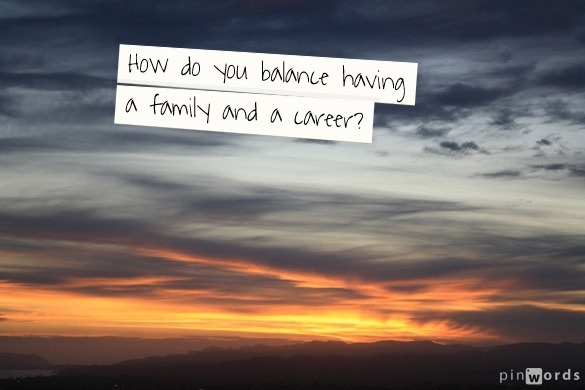 But with a demanding full time job, it’s hard to find the right balance. I’d love to be able to freelance and work from home if I could make enough money. as we think about this issue as well, I find myself with the same questions. How can my job ever win out wanting to raise my children? But why is it that I’m the one with this internal debate whereas it would never even cross my husband’s mind to stay home? Yeah – household labour will always be one of our bugbears and having kids will not help. T staying home is an option and one he might even like, and the way things are going right now that would make more financial sense but I don’t particularly want to be the only income earner, and in most other regards I would be the better stay home person (frugal, able to earn some income from home, better housekeeper – though no good with kids). Dealing with 24 hour shifts for you makes it even more difficult. I’m deferring the question for as long as possible… there are a lot of things in life that you can take back, but kids are THE irreversible decision. I once reader a blogger comparing “having kids” to “getting a tattoo on your face” in terms of how certain you should be before you make that decision. I do know that I want a dual income household because the security of having diversified income streams is very important to me. Our lives were almost impossible when we both worked full-time out of the home and had two small kids. Now that I work from home, things are a million times better. I can relate to how impossible you think it is to juggle it all because it truly is impossible. A lot of women do it well, but I thought it was hell. As you probably know, I come from a long long line of working women. We all turned out AMAZING. Absolutely zero guilt about work. In fact, growing up, I always felt really sorry for kids with SAHM– they always seemed so *helpless* (the kids, not the moms). Today I would never voice such a sentiment, of course, and I now know that they learned how to take care of things like laundry and feeding themselves in college (the kids, not the moms). I will say I was and am proud of my mom and grandma and aunts and great grandma and great aunts and so on up the line. And, for that matter, my MIL, and grandmother-in-law and up that line too, which is probably why my husband does his fair share of housework and child-rearing. Not to say that you might not prefer to stay at home with the kid 24/7, but that you should never ever feel guilt if you prefer to work 8-9 hours a day and spend mornings, evenings, and weekends enjoying the kid. Like a person above said, daycare is great for wearing them out, at least a little bit. Let your choice be a preference, not guilt-driven, because the kids will turn out just fine either way. Oh, I am totally opting out of this having-children business. I like spending money on myself! On the other hand, while trying to be helpful, there was a fantastic article on good parenting I read a while ago. It was on Flipboard, so I can’t remember which site! Arghhh, I’ll reshare if I can dig it up. I thought I’d weigh in since I’m an older parent with kids, so I’m living the work/life balance and most of my friends have already made the decision to have or not have kids. Here are my words of “Wisdom” based on my experience and observations, which may or may not help you! 1) Quitting a full-time job isn’t only about losing a few years of salary. You have to account for missed retirement savings, interest, and missed opportunities. If you return to the work force, your skills are outdated and it’s very hard to get back in or get in at the same level. You may also find it hard to adjust back to the work life pace. 2) You really have no idea of how you’ll feel or what you want to do until you have kids, and even then you change your mind often (as in some days I’m so glad I work and some days I wish I stayed home). 3) You’ll find time. My husband and I rarely watch TV or movies anymore, even though we really, really want to watch. I haven’t exercised in 2 years+ and even when I did exercise, it was sporadic at best. I’m not recommending the no exercise route of course! I see my friends much less often. I shop online for myself and much less often. 4) It’s all about your mental attitude. A long time ago, a television station in the U.S. was promoting re-runs with a slogan of “It’s new to you”. That was my mantra when it came to my kids and first steps, first words. First of all, many milestones are done in small increments and are not as sudden as you might think. I admit I was a bit bummed when my husband emailed me to say one of my kids had pulled himself up to a standing position but I truly enjoyed seeing new developments with my own eyes for the first time. AND most importantly, even though i work full-time and had a long commute, I somehow caught a lot of “firsts” anyway. 5) Don’t waste energy on feeling guilty. It’s really pointless.